Your browser is no longer competitive - time to upgrade! The AFL won't perform at its peak on Internet Explorer 11 or older. ...not many better ways to one-up his preliminary final appearance than by sacking your coach. this club keeps talking about doing things with lions and Ryder and Beams... ...walking the walk at some stage wouldn't be a bad idea too. you’ve promised your supporters for two seasons that you’re going to play more games at the 'G... ...this week’s announcement might have fallen a touch flat. there's one aspect of its operations in which Collingwood is confident right now... ...it is, despite all the talk, that Beams will stay. Ryder does indeed decide to activate the “clause” in his contract, and he again this week reiterated his intention to do just that... ...the Bombers have to take it to the highest court possible. you’re a Fremantle supporter... ...you’d be almost willing to pay yourself for the club to hire a goalkicking coach. GF last year, semi this year. Bad kicking, bad football. North fans ever boo Joel Selwood again... ...they should be ashamed of themselves. ...you're in a touch of bother. ...they're going to want a big name in return. Watch this space. the Hawks were playing the Swans this week... ...Brad Sewell would've been playing. Fell victim to the Hawks match committee watching the Power run riot last week. 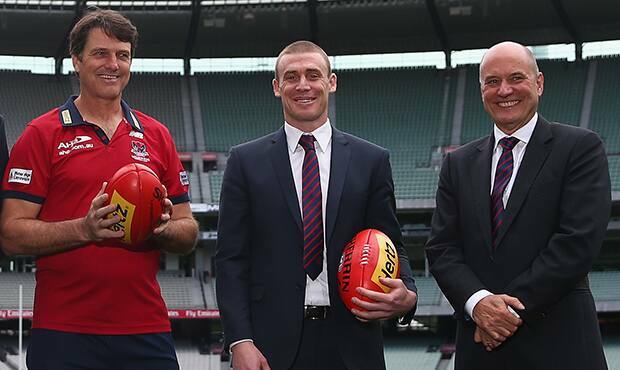 ...would they have Peter Jackson, Paul Roos and Simon Goodwin? Nope. Therefore, they've been compensated sufficiently and should not be given a compo draft pick. North Melbourne North somehow wins this week and Brent Harvey gets reported again... ...he's kidding himself. anyone outside of diehard Port fans claims to have foreseen the 2014 elevation of Robbie Gray into superstardom... ...they would be lying. ...it was only Matty Scarlett going with the Kevin Bartlett hairstyle six years ago. your body is shot, you can hardly train and are on the wrong side of 30... ...most see your career reaching an end. Riewoldt is an All-Australian and a B&F winner this year. this indeed is Adam Goodes' last season and possibly even his last match this weekend... ...can everyone - everyone!! - please realise we've been extremely fortunate to watch one of the truest champions in the history of the game. this week you're assessing the qualities of the two Perth teams and wondering which is better placed for a solid 2015... ...it is tempting to make a case for the Eagles. Western Bulldogs the Crows and the Suns have acted this week when made aware of significant player unrest against the coach... ...the Bulldogs will be thinking about doing the same.